Heat oven to 200C/fan 180C/gas 6. Mix the cheeses and mustard together. Cut a slit into the side of each chicken breast, then stuff with the mustard mixture. 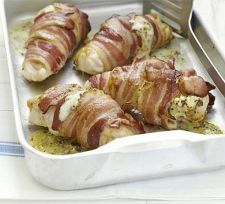 Wrap each stuffed chicken breast with 2 bacon rashers – not too tightly, but enough to hold the chicken together. Season, place on a baking sheet and roast for 20-25 mins.